The Canaan Dog (also known as the ‘Kalef Knaani’ or ‘Kelev Canaani’) is the national dog breed of Israel and has a distinct background from all other herding breeds. It dates back to Biblical times, when it served as the guard dog and herd dog of the ancient Israelis. There are several references to working or stray dogs in the Bible which likely refer to the Canaan Dog. A sarcophagus from the fourth century BC depicts Alexander the Great hunting with a dog that appears to be a Canaan Dog. The origins of the Canaan Dog are unknown, but it likely descended from the spitz (an ancient breed of white, thick coated dogs). After the Roman invasion in the 2nd century, most Canaan Dogs became strays in the Negev Desert, though a few were enlisted as guard dogs by the nomadic Bedouins. In the 1930’s, Dr. Rudolphina Menzel recognized that existing guard dogs for Jewish settlements were not well suited to the harsh terrain, and had the idea of training these wild desert dogs. She was able to capture and earn the trust of several dogs, and found them to be easily trainable. By World War II, her Canaan Dogs were serving as messengers, sentries, and mine detectors. Dr. Menzel wrote the first standard for the breed and in 1965 sent the first Canaan Dogs to America. 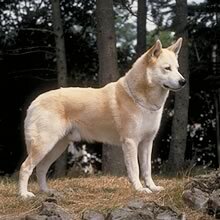 The Canaan Dog was recognized by the American Kennel Club in 1997. The Canaan Dog has a shoulder height of 48-61 cm (19-24 in) and weighs 16-25 kg (35-55 lbs). It has a long, wedge shaped head with almond shaped eyes, low set, upright ears and a level or scissors bite. Canaan Dogs come in an assortment of appearances. Dr. Menzel classified them into four types: heavy and sheepdog-like, lean and dingo-like, noble and Collie-like, and sleek and Greyhound-like. All have a short, arched loin region and bushy tail carried curled over the back when the dog is excited or alert. The Canaan Dog has a double coat consisting of a soft undercoat and straight, flat outer coat. The coat can be white with colored markings or black, brown, red, or cream, all with white markings. Canaan Dogs may have white or black masks covering the ears and eyes and a white blaze between the eyes. They shed heavily once a year. The Canaan Dog is intelligent, docile, devoted, and willing to please. Because it is highly territorial, the Canaan Dog should be kept in a fenced yard and walked on a leash. The Canaan Dog is intelligent, docile, devoted, and willing to please. Because it is highly territorial, the Canaan Dog should be kept in a fenced yard and walked on a leash. The Canaan Dog is generally good with other pets, but is somewhat aloof toward strangers and may be aggressive toward other dogs. It barks immediately at suspicious activity, making an excellent guard dog. The Canaan Dog is protective of its family. You can find Canaan Dog puppies priced from $0 USD to $0 USD with one of our credible breeders. Browse through our breeder's listings and find your perfect puppy at the perfect price. The Canaan Dog is generally good with other pets, but is somewhat aloof toward strangers and may be aggressive toward other dogs. It barks immediately at suspicious activity, making an excellent guard dog. The Canaan Dog is protective of its family. The Canaan Dog must be brushed once a week to remove dead hair. Canaan Dogs are generally healthy, but may be susceptible to epilepsy or PRA (a retinal disorder). They have a lifespan of 12-15 years. The Canaan Dog is intelligent, making training a fairly simple process. Canaan Dogs will become bored with repetitive tasks and may be distracted easily. Canaan Dogs, because of their working background, are never content to just sit around. Long jogs, strenuous games, or herding sessions will keep them happy. They are fairly active indoors, but can tolerate apartment life if sufficiently exercised. Canaan Dog Puppies for Sale - Shipped Worldwide! Finding the right Canaan Dog puppy can be dog gone hard work. PuppyFind® provides a convenient and efficient means of selecting and purchasing the perfect Canaan Dog puppy (or Canaan Dog puppies) from the comfort of your home, 24 hours a day, 7 days a week. Take advantage of our PuppySearch or leisurely browse our directory of hundreds of dog breeds, Canaan Dog dog breeders, Canaan Dog dogs for adoption, and Canaan Dog puppy for sale listings with photos and detailed descriptions. Some Canaan Dog puppies for sale may be shipped Worldwide and include crate and veterinarian checkup. Many Canaan Dog dog breeders with puppies for sale also offer a health guarantee. With thousands of Canaan Dog puppies for sale and hundreds of Canaan Dog dog breeders, you're sure to find the perfect Canaan Dog puppy.